Successfully Added Car Media Player with Detachable MP4 Player - 256MB to your Shopping Cart. The next generation in car entertainment has arrived with this Car Media Player. This exclusive model includes a special feature - a detachable PMP to take with you after you've parked your vehicle. Never be without your digital media again! The Detachable Media Player can be used just like any other PMP and includes support for multiple formats, an ebook reader and photo viewer. Easily take your music and movies with you wherever you go and simply recharge the unit when you return to your car. The 1 DIN unit itself features amplifier preouts and inputs so as to easily accommodate an existing in car audio set up. Buy today at Chinavasions amazing wholesale prices and resell to your customers for amazing profits. 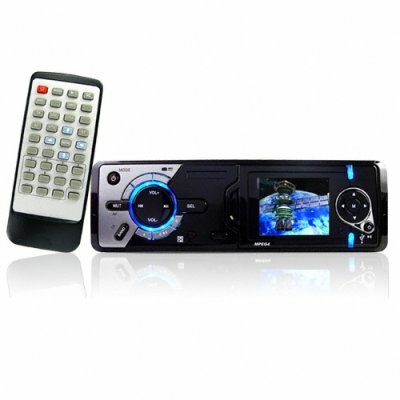 1-DIN sized combination car stereo and portable media player. Play your digital media in your car and outside of your car using the detachable player. Makes it easy to bring your digital entertainment files with you wherever you go. If you wish to make comments or reviews about this product, please use the product review. Please open an inquiry ticket if you have questions regarding this item.